Gimme-Jimmy has another nice review – Thanks, Leyla Atke! Nice Review of Gimmy-Jimmy, thanks to Leyla Atke! 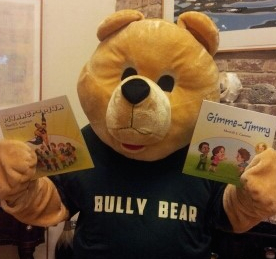 Gimmy-Jimmy is about how a bully learns to share, and the book will be part of the new Fundraiser for the imbullyfree organization! Please stay tuned for further updates. “Gimme-Jimmy by Sherrill S. Cannon is another great children’s book teaching kids good manners and to share with friends. Gimme-Jimmy is a boy with bad manners who takes everything and claims he owns it. That’s why he is called Gimme-Jimmy. Very soon, he faces a very unpleasant fact: every time he says “Gimme” his right hand begins to grow in size and becomes huge. He despairs and asks his father to help him. Father advises him to be polite with others and share with them. Jimmy needs to work hard to make his hand normal again. The story has a happy ending: Jimmy is a boy with good manners now and he shares everything with his friends. And his name is actually James now! This entry was posted in Uncategorized on April 30, 2014 by Sherrill S. Cannon. Pinnacle Achievement Award for My Fingerpaint Masterpiece! Award Winners for Spring 2014. This entry was posted in Uncategorized on April 29, 2014 by Sherrill S. Cannon. Thank you to 4-year-old Lily and her mother! “Just wanted so send you this photo of Lily’s paintings that were inspired by your book. She chose to paint our cat and her grandma’s cat. She made sure to put her name on them! She showed them at a talent show at her preschool. The circles are balls the cats are chasing. Thanks for being her inspiration! We have read a couple more of your books, but not all of them. We will read the rest soon! This entry was posted in Uncategorized on April 28, 2014 by Sherrill S. Cannon. Bully Bear loves Manner-Man and Gimme-Jimmy! This entry was posted in Uncategorized on April 25, 2014 by Sherrill S. Cannon. Lovely Review of My Fingerpaint Masterpiece. Thank you LAWonder! Be sure to include this marvelously entertaining book in your Summer Reading Programs! This is a delightful story that will surely capture and keep the interest of all elementary age students. It is also a great easy-reader for those students in beginning reading. Like many young students, this young boy began his finger-painting artwork but never finished it before the bell rang. On the way home the storm brewed, the wind blew, and his painting was whipped out of his hand and landed on the bench of s building a man was sorting artwork for display. This is a humorous account of the results of this unfortunate situation. The wondrous rhyming tale is a wonderful book for story time. It is certain to captivate the entire audience. The Title and book cover are perfect! The cover is eye-catching and colorful. The illustrations done by Kalpart are outstanding. This book earns a Five Stars review rating. This entry was posted in Uncategorized on April 23, 2014 by Sherrill S. Cannon. The Manner-Man Team on the way to a book-reading event! Author and the grandson who requested a book about a Superhero!! Colby loved her visit. I meant to email you about it. Getting any color about Colby’s day at school is near impossible. However, he had a lot to say about your mom and her stories. I forget exactly now, but he went on an on about a boy with a big hand or something :). Super cool mom! Tell her thanks for coming to the class from me 🙂 I swear Rhodes has had better manners and we didn’t know why! This entry was posted in Uncategorized on April 21, 2014 by Sherrill S. Cannon. Bullying was considered a rite of passage for decades but no longer. It is a cruel and viscous attack that now is spreading out of the schoolyard onto the Internet of repeated intentional harm, reported the NPR online today of the British study that appeared in the American Journal of Psychiatry. Decades later the chronic bullying effect with be displayed in a person’s socioeconomic status and effect cognitive function persisting onward through life. Sometimes it will begin to appear in a person’s late their late ‘20s. The British study consisted of nearly 18,000 children in England, Scotland and Wales, who were born during a single week in 1958. When the children turned 7 interviews began with parents twice and the children once until age 11. Questions about how often the children experience bullying were tracked and noted with the IQ score at that time. Reports from teachers reported any problems of anxiety and other behavioral problems. The check in reports for health and social well-being were done at ages 23, 45 and 50 with about 8,000 children. By comparison 40 percent of the children were reported as being bullied either on an occasional or frequent basis against estimates in the U.S. where 50 percent of the children state that they are bullied at least once a month. Once age 50 is reached, it is downhill according to Arsenault because the mental and physical health effect only increase. Dr. William Copeland, a clinical psychologist and epidemiologist at Duke University, who wasn’t involved in the British study, believes that this is a valuable study due to the length of time and follow-up throughout the decades. His work has led him to believe that bullying is harmful and not a rite of passage for children. Bullying has now extended its reach and same methods to cyberbullying on the Internet. Predators on the Internet according to Copeland single out a weaker person and can stage repeated events for intentional harm. It is no longer abuse; it is a full-blown attack on a human being meant to destroy the person. It can also come over texts and mobile phone with someone attempting to either damage a person through reputation assault or constant harassment directly to infiltrate into all areas of the person’s life. The award winning author, Sherrill S. Cannon, has written a children’s book ‘Manner-Man’ which stands up against bullying. Cannon states on the Amazon listing review of five stars for the book, ‘Manner-Man’ is a superhero that helps children learn how to cope with bullies. Her journey began with her award-winning children’s book, ‘The Magic Word’. The story instills good manners and respect for all. Where else can words be so harmful as on the Internet? Manner-Man has already won two awards: Readers’ Favorite Silver Medal and a NABE Pinnacle Achievement Award. Her book and words show children that they can use peer pressure to stop bullying, and that each child has a ‘superhero’ within. You can read the reviews of Cannon’s children’s books, her awards and how to contact her on her website. She fights against bullying and she also donates 50 percent of her books’ revenue to fight Juvenile Myositis (JM), an incurable disease. Whether a child is struck early with a physical disease as JM or is bullied it is not to be passively accepted. Cannon’s voice will have an effect on future generations due to her work with impressing positive behavioral actions onto children. Manner-Man is found within each of us at any age.